THOUSANDS of revellers took to the streets of San Fernando today for J’Ouvert celebrations in one of the biggest crowds ever, but one aspect of this Carnival event was visibly lacking — traditional mas. Of the 26 mas bands that paraded before judges at Harris Promenade, only one— D Blue Boys— was in the traditional category. The others were modern mas bands which filled the streets. With traditional mas at death’s door, veteran bandleader Val Ramsingh, 68, said it breaks his heart but “somehow or the other we allow propaganda.” He also accused “the powers that be” of doing nothing to revive it. D Blue Boys J’Ouvert band presented Mind Yuh Business, a satirical presentation in which characters poked fun at politician and officials. The presentation was in memory of masman George “Bunny” Dieffenthaller who died last month. Wearing a dress, fake breasts and a wig, Ramsingh said just as Holly Betaudier formed a parang bandwagon and revived parang when it was dying, so too would he and his band for traditional mas. “We need to do something like that to rescue ole mas and J’Ouvert. We are looking to remodel it, but we don’t want to dilute the brandy. You do not dilute a brand, so we are looking for sponsorships. 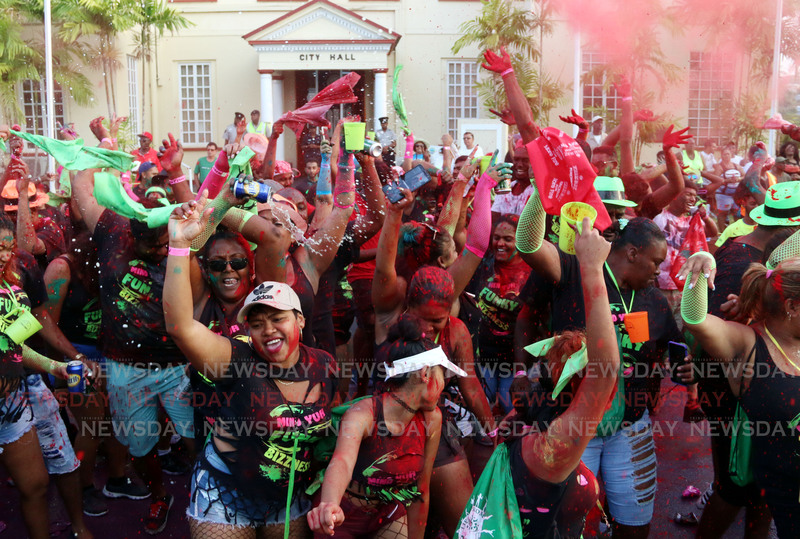 We do not want J’Ouvert to descend into a street party,” Ramsingh said. D Blue Boys has won the J’Ouvert band of the year title for 25 consecutive years. This year marks its 37th consecutive years of producing “authentic J’Ouvert ole mas". There was only one judging point this year for mas and steelpan. Speaking with reporters, San Fernando mayor Junia Regrello agreed that traditional mas was dying, but said new trends are developing as Carnival evolves. Young people, he said, are not participating in “placard mas” compared to years ago. From at about 5.20 am, Regrello officially declared the start of the two-day festival. Less than 15 minutes later, the first band D Pub crossed the stage with its presentation Radio Active, followed by Jama Productions with Jama-Daba-Doo. The sea of revellers dressed in brightly-coloured clothing, most of which consisted of t-shirts with logos, danced and wined to soca music. Savannah Grass by Kees Dieffenthaller and Famalay by Machel Montano, Bunji Garlin and Skinny Fabulous are the two road march contenders in San Fernando. Recently crowned Soca Monarch Mr Killa was also a favourite as music trucks blasted his song Run Wid It. Some of the other large bands include Limerz Krew, Poudre, Dev’s Barbershop Crew, Me Gusta Caliente, VH and associates, Hunters International, A&K fashion lab and B man and Lord Street Fusion family events. San Fernando East MP Randall Mitchell played with Dev’s Barbershop Crew. They were only a handful of steel bands with La Romaine Super Vibe performing first, followed by Ole Tech Steel Orchestra and Union Hall South Landerz Steel Orchestra and Caribbean Airlines Skiffle Steel Orchestra. Up to midday, Southern Division police said it was a crime-free J’Ouvert. Reply to "Modern mas a hit at J’Ouvert San Fernando"